My kitchen tips! 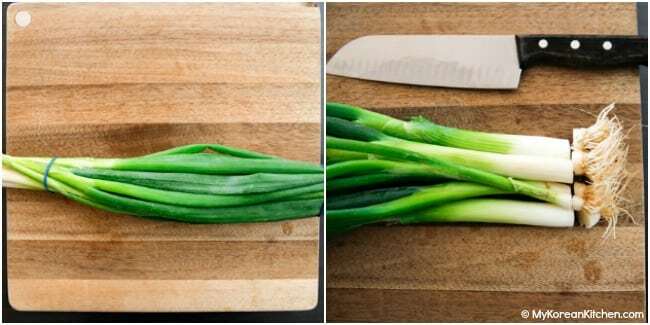 Learn how to store green onions so that they last long and fresh. With proper care, they can last for 4 to 5 weeks! Eager to find out my secret? Read on then. 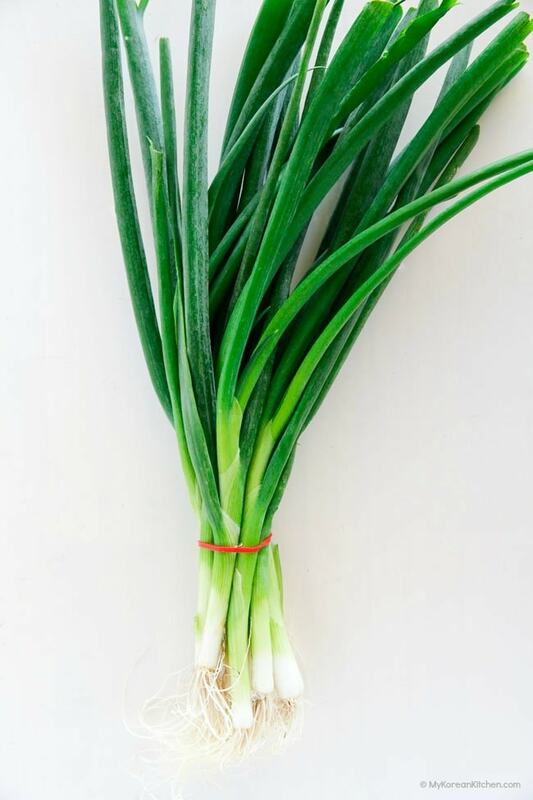 Green onions, also known as scallions, and pa / 파 in Korean, are used in many Korean and Asian dishes, so I think it’s only natural that we talk about how to store them here. Right? I’m sure everyone has their own tips on how to best store them, which I would love to hear, but with my method, you can expect fresh (or -ish) green onions even 4 to 5 weeks after the purchase. (Sometimes even longer!) Intrigued? I’m not a food scientist, but I think the most important aspect of storing green onions is controlling the moisture. What do you think? Well, at least for me, that’s the case. I’ve been using my method for a couple of years now and it’s been working very well. So I won’t hold you from my secret any longer. Here it goes! 1. Remove the rubber band (if any) that’s holding the green onions. Line up the green onions and cut the root off. 2. Halve the green onions to fit into a large ziplock bag. 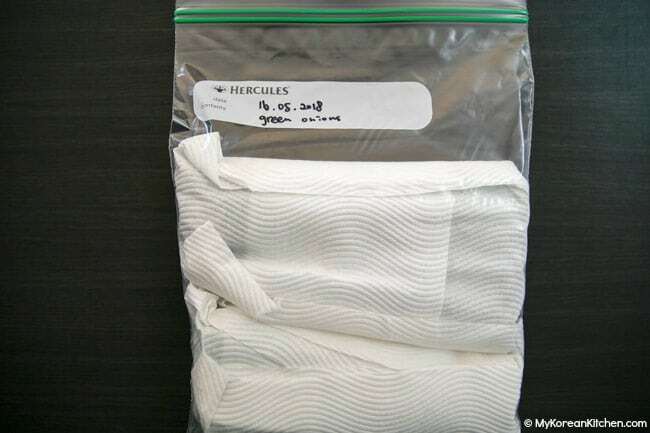 (The ziplock bag should be at least 27cm x 33cm / 11 inch x 13 inch.) Trim off edge of the green onion if some sticks out and it isn’t going to fit into the bag. 3. 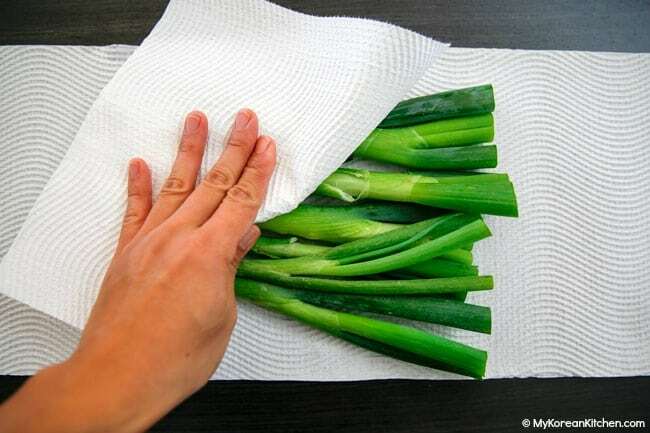 If the green onions have some moisture on them gently wipe them down with paper towel. 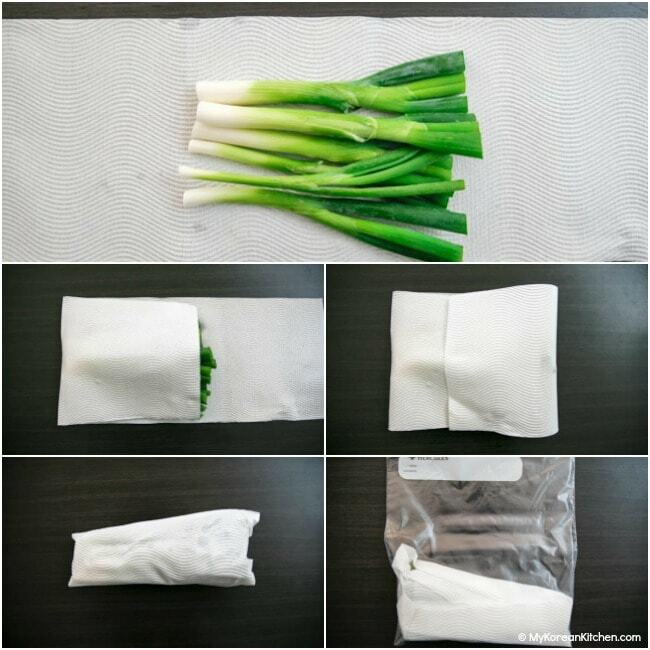 Place the green onion white part in the middle of the paper towel. Firmly wrap the green onions with the paper without squashing the green onions. Place the wrapped green onions into the ziplock bag. Repeat this with the green onion green part. 5. Seal the bag and place it into the fridge. (I place it in the bottom of the fridge – vegetable drawer). 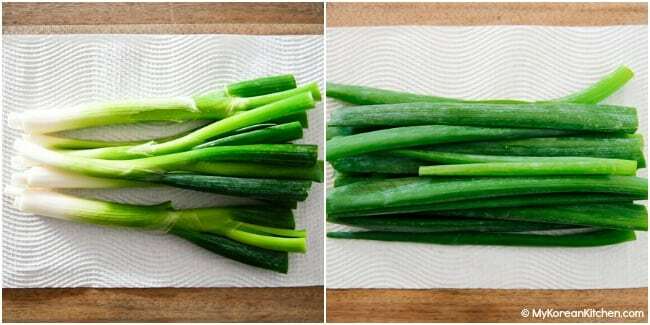 While storing, don’t place any heavy objects on top of the green onions. 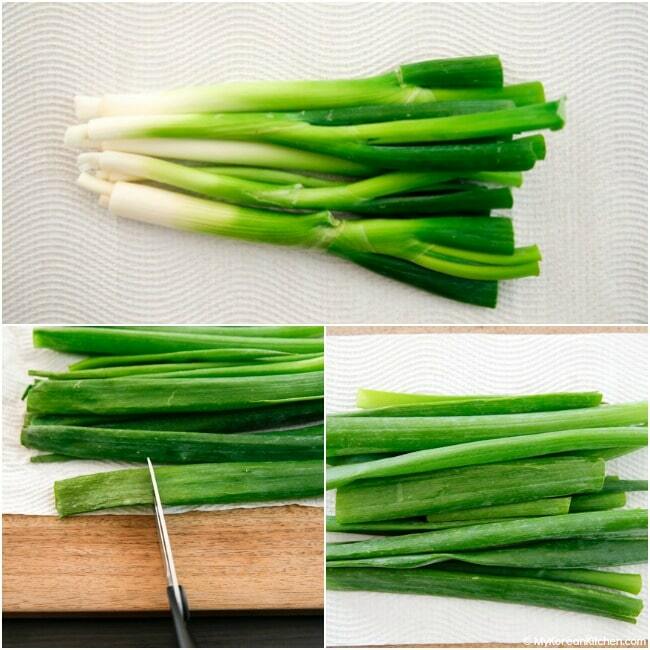 Take out the green onions and gently wipe down any moisture on the green onion surface once a week. Inspect the green onions and discard any softening green onion parts (if any). 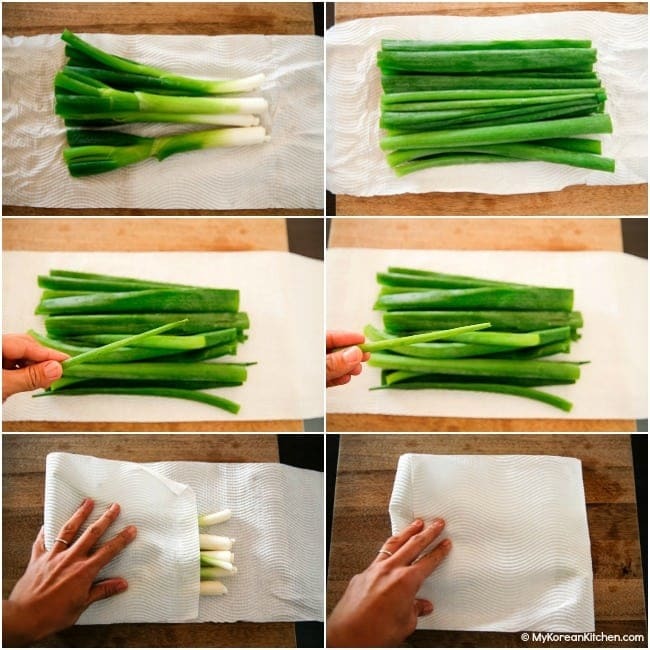 Replace the paper towel for both green onion white part and green onion green part. Wrap them around as you did before (in step 4) and place the wrapped green onions into the ziplock bag again. Return the bag into the fridge. Repeat step 6 until all green onions are consumed. P.S. If you have your “tested secret” of keeping green onions fresh for as long as mine, please do share it in the comment section of the post. I’d love to know! P.P.S Love green onions? 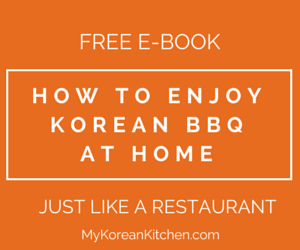 Then try my Korean green onion salad recipe. It’s a popular Korean BBQ salad. I do this with my lettuce. The last iceberg lettuce I bought lasted 8 weeks! (i don’t use it often)Just be sure to replace paper towel weekly! Keeping the extra moisture out is the key! Pretty cool. I used to just put them in a heavy duty freezer bag, but never used to cut the stems off, wipe the moisture off or wrap it paper towels. Must try your technique. Usually once a week but the last batch went without a water change for five weeks while I was away and were fine. So easy to grow shallots (or, as we call green onions in Australia). I have been planting the roots for years, as others above have suggested, but learned it from my grandma. I rarely have to buy or store them anymore. You can plant them in the garden, or put them in a pot, and always have them fresh at hand. I use the same method, but leave the roots on and don’t cut the stems, just fold them. Hi Sue! This is a really good tip on storing green onions so they would last longer that I never knew about before. I should try it out. The method that I’ve been using is method my mother used which slice the onions into pieces and store them in the Tupperware in the freezer. But of course this method wouldn’t work if you plan on using fresh green onions as a garnish or topping instead of cooking with them. By the way this is my first post and I really love all your recipes. 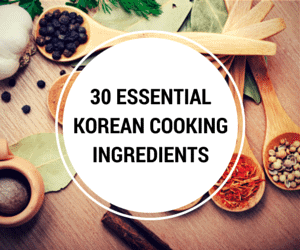 Being Korean I never really saw exactly what went into ingredients that I had growing up. But now as an adult I love cooking them myself and it is largely due to you! Thank you so much Sue! Why did I have to resort to Google to learn what you all already know, LOL? Hi Sue, yes I like your storage method, but to be honest if I need to store them for more than a couple of weeks then I’m not cooking enough! I just take the band off and leave them loose in the salad drawer – usually good for 2 weeks. Then peel off any sad looking leaves when ready to use. Thanks and Regards. Very good point, Clive! – Not cooking enough! 🙂 In rare times, I forget that I have green onions in my fridge and find them like 7-8 weeks after I put them into a bag. Obviously, they haven’t been maintained as well as they should be, but I am still able to salvage some. Love your method of storing green onions. Going shopping tomorrow and will give it a try. Thanks, Lawrence! Let us know how you go! I do the same thing with my cilantro and it works famously. Thank you for sharing. I use a lot of scallions in my kitchen and will start treating them like I do my cilantro. I just do paper towels. Anything to keep the water that seeps out away from the vegetables really helps. Every few days I replace the paper towels. To cut down on waste and expense (those bags get pricey when you use a lot of them) I clean out and reuse the bags a time or two before I throw them out. With the veggies wrapped in paper towels, they don’t get that messy. I do reuse the ziplock bag for green onions, several times. Wipe it and dry it first before reuse of course! Thanks for pointing that out. I needed this tip. Thank you! You refer to “kitchen paper?” Is this paper towels, parchment or wax paper? Thanks for the great tips! My green onions seem to stay fresh only for a few days… Will try out these tricks! A friend showed me how she cuts the root end off about 1″ from the bottom and sticks them in a small pot of soil so they’re just peeking out. They grow new tops, so you have fresh green onions again! It works! Used my “homegrown” last night! I am going to be planting some in my garden tonight. Great tip. I dry my green onions cut them up and put them in a jar and freeze them! Then I use them in salads and other recipes calling for them. You would be surprised how fresh they taste! I tried this method (in a regular plastic container not in a jar – not sure whether this will make any difference), but it’s so hard to take out the frozen green onion pieces! LOL. Also, they give mushy or wilted feel once sitting in the kitchen bench for about 10-15 mins while I’m cooking. I’m wondering if I’m missing some steps. Glad to hear it’s working well for you though! I save the long bag celery is packed in. Make sure it’s dry by turning bag inside out to dry. I do not cut the root ends off, so lesser chance of drying out. I wrap the entire in a paper towel and place in celery bag. no need to tie off bag, prevents moisture from building up. Thanks for this tip. BTW, I plant the rooted ends. Simply stand them up in water for about 24 hours, then put them in moist potting soil. They grow quickly, indoors or out. Thanks for the tip! Will try planting some from now on. My hubby will love this idea for sure! The method I use is even easier. Take off the elastic band, rinse the roots and remove any decaying bits and store upright in 1″ of water in a jar, loosely covered with a plastic bag in the fridge. I have kept them this way for well over six weeks. You can also regrow green onions just from the roots. 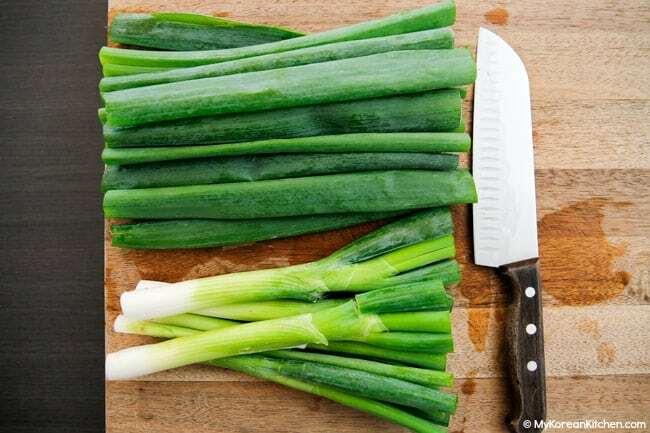 When you are using the green onions, save 1 or 2″ of the root ends, place in a glass or jar of water at room temperature and the onions will grow back. I’ve heard of this method before. But I didn’t realize they could last for 6 weeks+?! That’s amazing. Actually, I just came back from a 5-week long trip, and the already six-weeks old green onions I had left stored in the fridge that way were still good and firm! I guess one can store them pretty indefinitely with that method. I do something similar with almost all of my vegetables. It works well to keep lettuces, broccoli, cabbage, green beans, snow peas, zucchini, eggplant, or any other veggie that isn’t too water-based. For instance, it doesn’t work so well with cucumbers or peppers. That’s good to know! Thank you. Great tip! As usual, not only do you have great recipes, you offer advice to make them the best they can be. 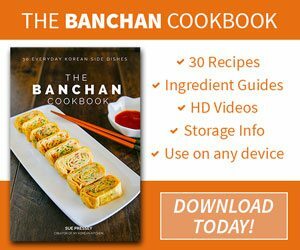 My family is addicted to your recipes! I can’t thank you enough.